Put it in your head. Coca Cola Co. proves it can be wild and crazy with this one. 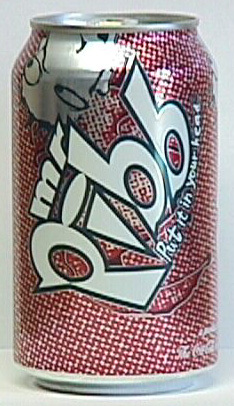 Mr Pibb is probably the most accurate imitation of Dr Pepper, but I cannot find it for sale anywhere on the east coast. Just as well, though, because it's not that great. If you can't find a can, there's an easy way to simulate the taste: pour some DP in a glass of ice, let the ice melt, the add an equal part of corn syrup. I give it an 8.